Evaluating (and minimizing) water hammer in a liquid sampling system — A common yet often unidentified problem poses a significant threat to any liquid sampling system. It is called water hammer, and it may be lurking in a system, ready to wreak havoc on fluid system components. How to mitigate water hammer? The phenomenon of water hammer may sound familiar from domestic plumbing. It is the knocking sound that occurs in a pipe when a faucet is turned off abruptly. But in finely tuned liquid sampling systems, the effects are more severe. A sudden pressure spike — strong enough to damage or destroy numerous pressure gauges, flowmeters, pumps, and other sensitive, critical components — can pulse through the system without obvious warning. If the pulse is powerful enough, it can even burst lines or end connections, which could be dangerous if the system contains toxic and/or high-temperature fluids. Water hammer can be puzzling, disruptive, and damaging for any operator. It occurs when a valve suddenly closes, and liquid flow is stopped. In typical sampling systems, the root of the issue can often be overlooked or misdiagnosed. The system’s maximum process pressure will not exceed its design, so where does the extra pressure come from? Fortunately, an operator can identify, estimate, and minimize water hammer if he or she knows what to look for, and the right steps to take toward mitigation. Let us take a closer look at what is happening inside a sampling system when water hammer occurs. When a valve closes and interrupts liquid flow, something must absorb that liquid’s momentum to bring it to a standstill. Because the liquid is heavy and moving quickly, the force required to decelerate the liquid creates a pressure surge. The surge originates in the compression of the liquid and from deformation of the tube walls; the resulting pressure wave then travels upstream in the tube. This surge happens quickly — usually too quickly for a typical proportional relief valve to perform its intended function. The rapid pressure spike may cause the relief valve’s rupture disc to burst as intended, but this will occur too late to alleviate significant damage to an upstream sensor or flowmeter. These components will have already received the full force of the pressure spike before the relief valve opens. In the above example, the result is 14 bar of additional pressure in the sampling system that the operator has most likely not planned for and may not be tolerated by the system. If the system flows at a higher velocity than 1 m/s, the pressure spike would be even higher. In this example, t represents the time it takes for a pressure wave to spread upstream and reflect back to the valve. The full pressure pulse only occurs when the reflected pressure wave returns to find a closed valve. The above result, then, indicates the pulse will be less than the calculated pressure if the valve takes longer than 142 ms to shut off. In other words, the water hammer pulse can be minimized by closing the valve over a longer period of time than 142 ms. In domestic plumbing systems, water hammer can be solved by installing vertical pipes containing trapped air near each faucet, therefore eliminating the unpleasant knocking sound. This design could theoretically work in liquid sampling systems, but it would unfortunately create a dead leg that could lead to unacceptable sample contamination. Thus, a different approach is required – one that manages flow to mitigate water hammer. One option to better manage flow is to use multiturn needle valves with tight shutoff seats to slowly shut off flow rather than ball valves, which stop flow instantaneously. Ball valves cannot be closed slowly (or throttled) without causing damage to the valve. The sudden flow stoppage from a ball valve can potentially cause major pressure surges in sensitive sample conditioning and transport systems and lead to damage. A system featuring multiturn needle valves (shown in the fast-loop module in Figure 1) allows operators to stop flow more slowly, effectively dissipating the liquid’s momentum over a longer time period to minimize water hammer pulses. It is important to note, however, that needle valves will cause more pressure drop than ball valves, so operators should make sure supply pressure to the system is adequate if needle valves are used. A second flow management method is to simply divert liquid flow in the system instead of stopping it. Figure 2 shows a fast-loop system with a common handle that controls two bypass valves, ensuring that each valve can’t be moved independently. A three-way ball valve with specialized porting can be used, opening a bypass flow path before the main path closes. In such a system, the valves are never off, effectively eliminating the potential for water hammer to occur. Even if a system is designed as described, valve operation can still cause minor water hammer, and the associated pressure pulses can damage pressure gauges. Installing pressure snubbers can minimize this potential and protect all gauges that might be exposed to an unintended pressure pulse. 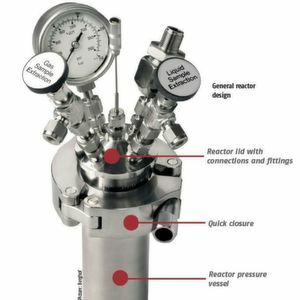 A pressure snubber simply slows the response of a pressure gauge, protecting it from the full transient pressure pulse occurring within the line. Water hammer can cause issues in any liquid sampling system, including maintenance headaches, downtime, and potentially dangerous situations. Use the Joukowsky equation to estimate water hammer. Use needle valves to shut off sample lines. Consider diverting flow rather than shutting it down completely. Use pressure snubbers to protect pressure gauges throughout the system. These tips will help to effectively mitigate water hammer, thereby enhancing safety, reducing maintenance needs, and minimizing system downtime.